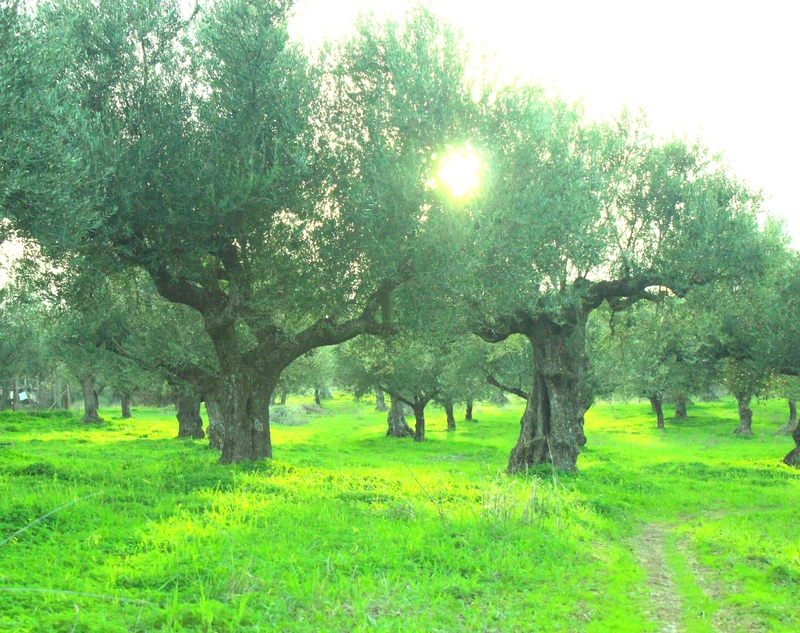 Lakonia holds the most favorable conditions in the entire world for producing the finest quality olive oil. Because Lakonia has hot, dry summers and mild winters, these circumstances have allowed olive trees to flourish since ancient times. And this is where we grow our olives for our BOLD Vrisi36 Olive Oil. Such an adventure, exploring Greece! 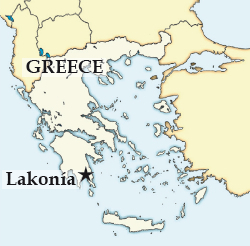 Episode 104, of My Greek Table, shows Diane in Laconia or spelled Lakonia, a region of Greece, which produces Extra Virgin Olive Oils with high polyphenol content. Polyphenols are the the good for you- plant warriors, which fight disease and aging. Absolutely we all want to be healthy and olive oil is perfect for helping us achieve this. But, not all olive oil has been created equal, in other words, some have high amounts of health properties and some, or much of the olive oil category, has been adulterated and highly refined leaving zero positive health properties. Bottom line is, know where you olive oil comes from! If you would like more info on this ongoing problem in our industry, search on the web, “common adulterated foods in world”, and unfortunately olive oil is top of this list. 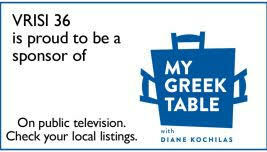 Short Clip from episode 104, Olive Oil Everything, My Greek Table with Diane Kochilas, full version here. This territory in Greece, located in the southern tip of the Peloponnese, started Olive oil production around 1500 BC. If you watch the episode 104 above, you will notice the press used in those times. Modern times, this region still produces the highest polyphenol Olive Oils, as Lakonia holds the most favorable conditions in the entire world for producing the finest quality olive oil. Because Lakonia has hot, dry summers and mild winters, these circumstances have allowed olive trees to flourish since ancient times. 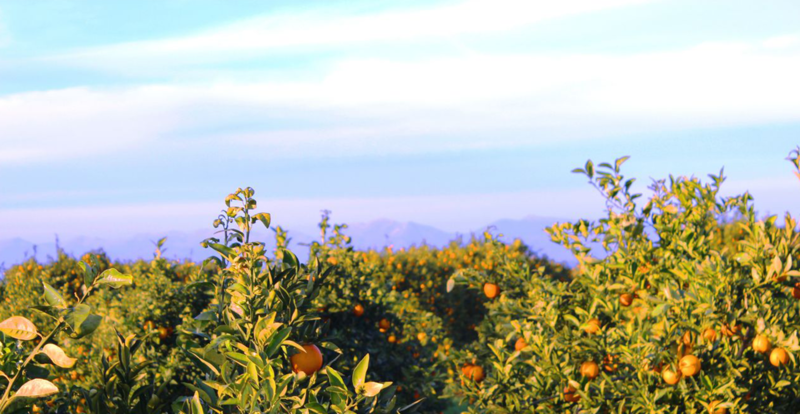 Many of our trees are over a hundred years old, and are still producing due to the rich, exclusive soil configuration and a rocky, mountainous terrain. In many parts of Greece, rich soil is hard to find, and the Lakonía region has some of its best. The mountains are ideal for our olive trees to gain rich exposure from the sun, while benefiting from the salty sea breezes of the Mediterranean coast. 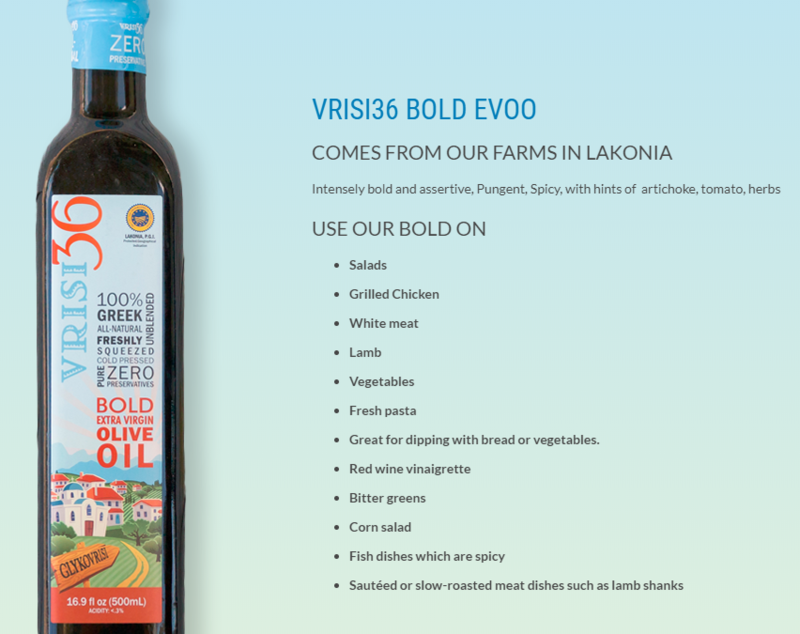 V36 Bold EVOO comes from Lakonia, and naturally produces a peppery, fruity and spicy flavor, by using an incomparable single variety, from the notorious Koroneiki olive. Our oil of the Koroneiki is never blended with other oils, thus maintaining its pureness and delicious flavor. When gathering our olives, timing is everything. Harvest occurs just before the olives ripen and change color, when the acidity is low and the fruit is at its peak. 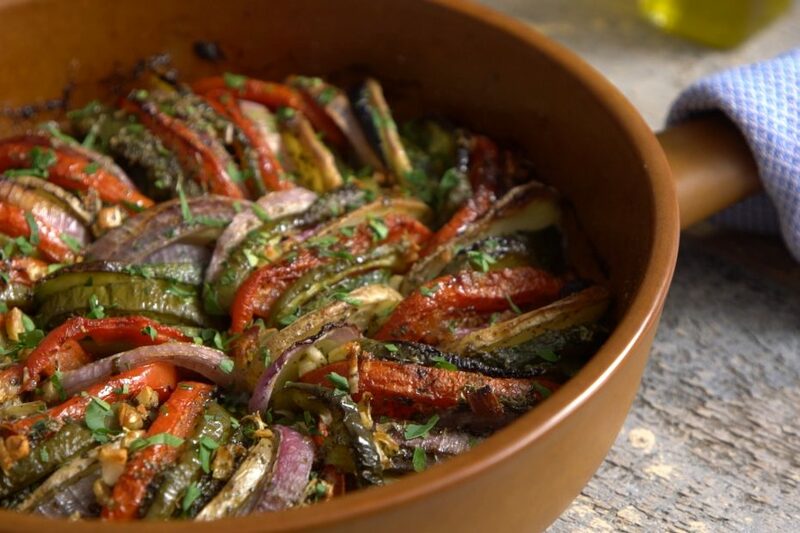 Try this recipe using fresh vegetables, our BOLD Lakonian olive oil and herbs. This recipe is from the episode, Olive Oil Everything, My Greek Table with Diane Kochilas. We also have a more herbal and grassy olive oil, which comes from the region of Messenia of Greece. We will explore this region in a separate post, next week. We all know there is a big difference in quality of Olive Oils. This variation in excellence is the reason Greek Chefs, or people who know good olive oil, always choose single sourced, regional, Greek Olive Oils, such as Vrisi36. Single Estate Olive Oil is very hard to find in the USA. We are fortunate to work with our family farms in Greece to bring you exactly what they eat in Greece. 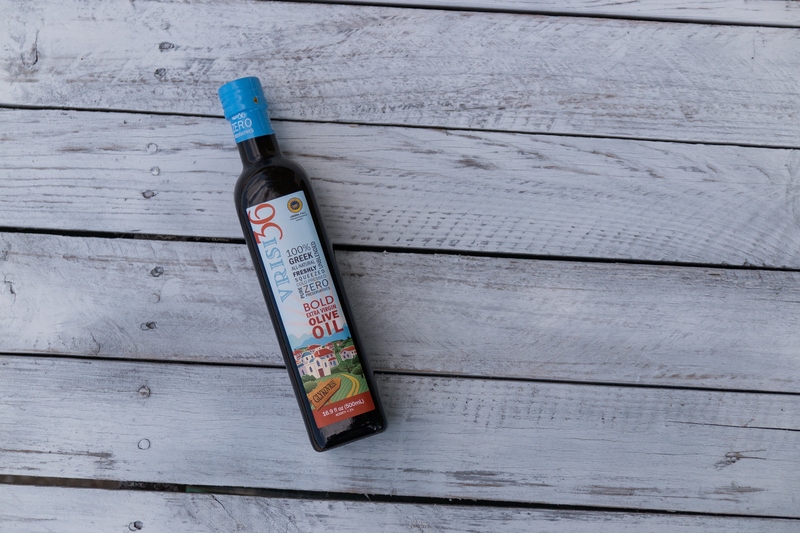 Our EVOO has never been refined, no heat in extraction, filtered once with paper, first press, are not blended within regions and are bottled at the farms from which they are grown. We are fortunate to live in Raleigh, NC and are able to remotely work with our farms in Greece to bring you the real thing! This entry was posted in Olive Oil, Uncategorized and tagged chef show, diane kochilas, Greece, greek olive oil, laconia, lakonia, my greek table, olive oil, real olive oil. Bookmark the permalink.